The Silver City is a place overflowing with outback soul and adventure right on its doorstep, writes Jessica Schumann. Drenched in light, vast blue skies and clear nights ablaze with stars, Broken Hill is a Mecca for artists and is a culture hub in its own right. Situated just 50km from the South Australian border, the affectionately named Silver City is rich with authentic experiences, artefacts waiting to be discovered, and an overflow of nationally significant heritage. Broken Hill will greet you with classic outback hospitality, impressive history and a powerful punch of breathtaking beauty. It is one of the few places in the world where you can stand in a street with civilisation at your back and nothing but red desert as far as the eye can see in front of you. Since its inception in the 1880s, the Silver City is today recognised as the boldest of the Australian outback locales, giving way to a local passion for the arts, culture and literary connections. Art deco shops interlace an offering of more than 30 quirky art galleries, each featuring the works of local artists inspired by the town’s architecture and stunning surrounds; none more jaw-dropping then the colossal canvas appropriately titled ‘The Big Picture’, which features more than one million brush strokes and took five years to conceptualise. But the mining town offers visitors more than just a collection of brush strokes and acrylic paints with gateways to a breathtaking range of diverse landscapes to explore including the vast expanse of the Mundi Mundi plains near Silverton, the mesmerising Menindee Lakes in Kinchega National Park and the rugged, red vibrancy of the Bynguano Ranges surrounding Mutawintji National Park. Originally made up of nine natural ephemeral lakes and holding more than four times the volume of Sydney Harbour, the Menindee Lakes are a comfortable one-hour drive south-east from Broken Hill and rewards the outback traveller with one of the finest freshwater fishing spots in NSW. They lakes are also home to an array of waterbirds; a living dream for any photographer. 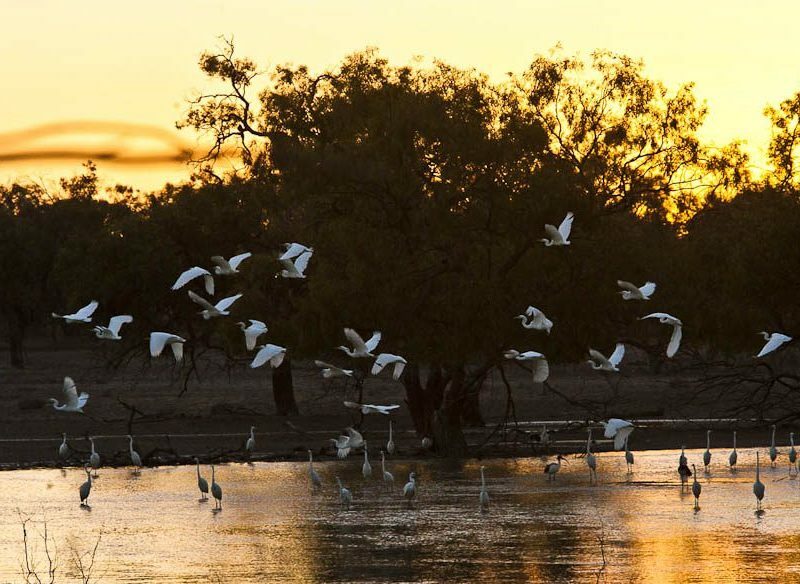 One-day tours of Kinchega National Park, departing from Broken Hill, are available through Tri State Safaris, with morning tea on the banks of Lake Pamamaroo the perfect introduction to the Menindee Lakes system before exploring the majestic lakebeds and rich pastoral history of Kinchega. Silver City Tours embrace the outback offering tours of the region and its history with local guides; its tours include Menindee Lakes and Kinchega National Park. If you’re not a morning person, then an afternoon basking in the winter sun, sipping on billy tea with the Barkindji Elders on the banks of the Darling River at Kinchega, may be more enticing before indulging in one of the modern hotels and havens in Broken Hill for the night. The city’s central location makes it the ideal base from which to explore the entire outback region. With a decent night’s sleep behind you, it’s time to venture north to the remote, rugged country of Mutawintji National Park. Home to the famous hand-stencil art of local indigenous communities, remnants of forgotten fireplaces, stone flakes and rock engravings can be discovered in guided walking tours or in the serenity of a private tour with Tri State Safaris or their sister tour company, Mutwintji Eco Tours, which has more than 20 years experience. Tri State Safaris also offer guided passenger or vehicle tag-along one-day tours. Dreamtime stories are brought to life by the ancient wonders of the land as they’re revealed at every turn of the river red-gum lined gorges and rock-pools; a majestic activity lead by local Aboriginal guides. 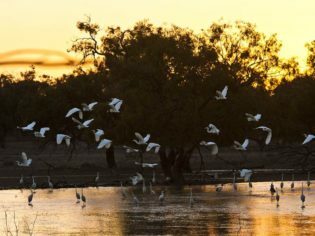 If one-day tours aren’t for you then an overnight stay is the ideal way to breathe in the fresh country air and unwind under the stars that spread across the vast outback skies. Set up camp beside the Darling River and soak in the tranquil vibe of the idyllic riverside campground, or head across to the Kinchega Shearers Quarters for a taste of simple living if the comfort of a bed is preferred (bookings essential). Or pitch a tent under the towering river red gums at Homestead Creek campground at Mutawintji National Park. Suitable for caravans and camper trailers, this large and well-equipped campground is the perfect location for relaxing on your touring holiday throughout Outback NSW. For accommodation options and other ways to make planning a trip to Outback NSW easy, visit NSW National Parks.